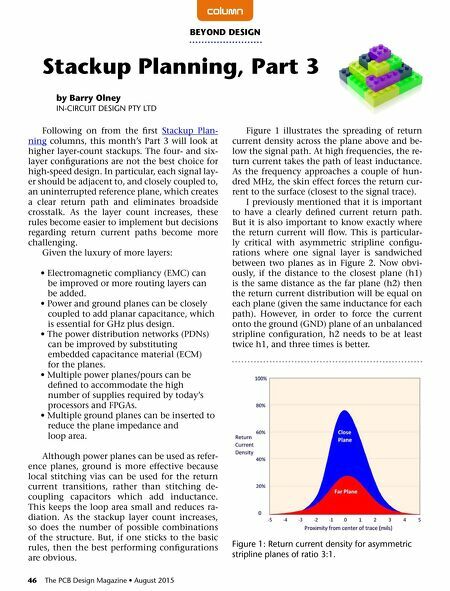 46 The PCB Design Magazine • August 2015 Following on from the first Stackup Plan- ning columns, this month's Part 3 will look at higher layer-count stackups. The four- and six- layer configurations are not the best choice for high-speed design. In particular, each signal lay- er should be adjacent to, and closely coupled to, an uninterrupted reference plane, which creates a clear return path and eliminates broadside crosstalk. As the layer count increases, these rules become easier to implement but decisions regarding return current paths become more challenging. Given the luxury of more layers: • Electromagnetic compliancy (EMC) can be improved or more routing layers can be added. • Power and ground planes can be closely coupled to add planar capacitance, which is essential for GHz plus design. • The power distribution networks (PDNs) can be improved by substituting embedded capacitance material (ECM) for the planes. • Multiple power planes/pours can be defined to accommodate the high number of supplies required by today's processors and FPGAs. • Multiple ground planes can be inserted to reduce the plane impedance and loop area. Although power planes can be used as refer- ence planes, ground is more effective because local stitching vias can be used for the return current transitions, rather than stitching de- coupling capacitors which add inductance. This keeps the loop area small and reduces ra- diation. As the stackup layer count increases, so does the number of possible combinations of the structure. But, if one sticks to the basic rules, then the best performing configurations are obvious. Figure 1 illustrates the spreading of return current density across the plane above and be- low the signal path. At high frequencies, the re- turn current takes the path of least inductance. As the frequency approaches a couple of hun- dred MHz, the skin effect forces the return cur- rent to the surface (closest to the signal trace). I previously mentioned that it is important to have a clearly defined current return path. But it is also important to know exactly where the return current will flow. This is particular- ly critical with asymmetric stripline configu- rations where one signal layer is sandwiched between two planes as in Figure 2. Now obvi- ously, if the distance to the closest plane (h1) is the same distance as the far plane (h2) then the return current distribution will be equal on each plane (given the same inductance for each path). However, in order to force the current onto the ground (GND) plane of an unbalanced stripline configuration, h2 needs to be at least twice h1, and three times is better. column by Barry Olney in-CiRCuiT DesiGn PTY lTD BEyOND DESIGN Stackup Planning, Part 3 Figure 1: Return current density for asymmetric stripline planes of ratio 3:1. 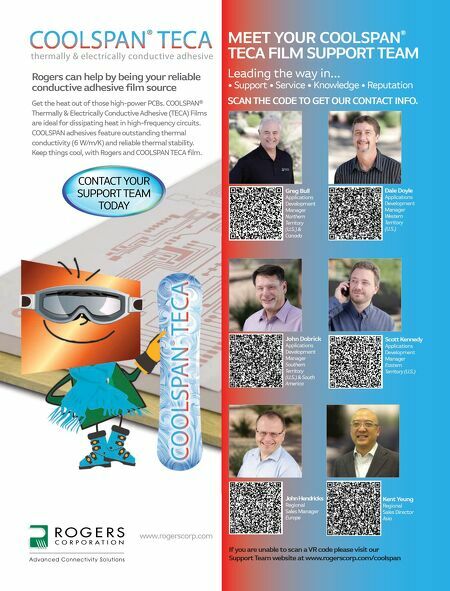 Article — Training the Next-Generation Engineer: When Does it Begin and End?